What stands between people and the jobs and promotions they seek? Assessments, job applications, interviews, boards and reviews are all a part of moving forward. But no matter how much we study, practice and prepare, the conscious and unconscious biases of decision-makers and administrators can affect whether we are in or out. In the bigger picture, when damaging and discriminatory biases shape institutions, institutional racism and sexism maintain racist and sexist status quos. But how is this institutional discrimination measured and how can this data change the status quo? Large-scale data can put a number to how institutional racism is impeding social mobility among BAME workers across the UK. The devastating long-term consequences for BAME employees as well as the UK’s economy can be measured at £3.2 billion per year in lost wages. 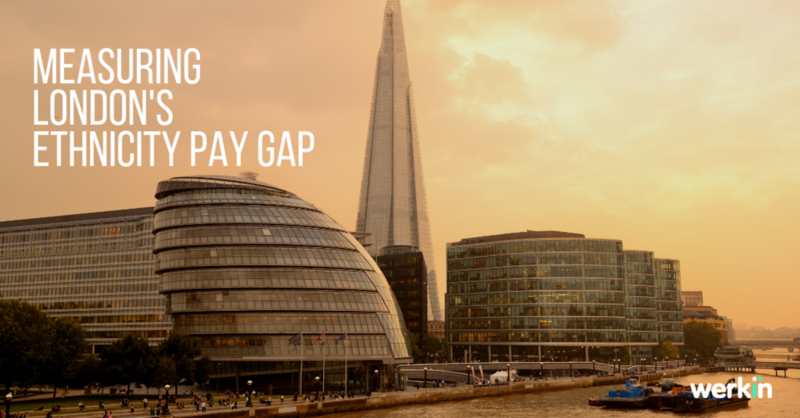 Sadiq Khan, Mayor of London has led an ethnicity audit into the Greater London Authority (GLA) and found a mean ethnicity pay gap of 14.8% and the overall median of 10.28% in 2018. These gaps represent an increase from 2017, 11.63% and 3.47% respectively. 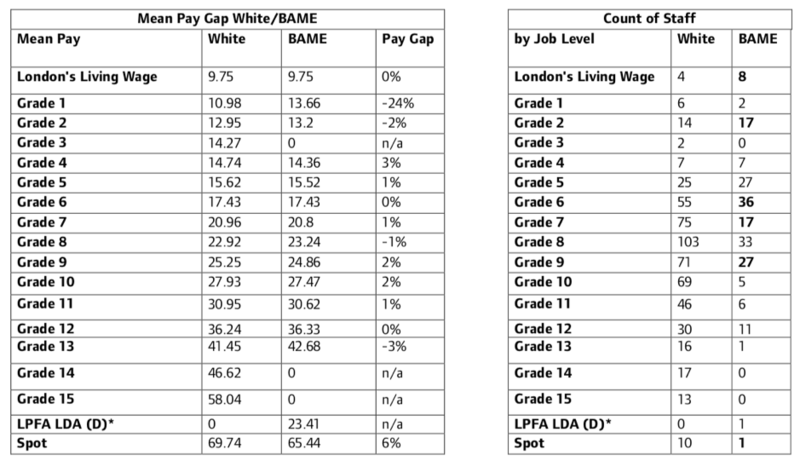 The audit shows the ethnicity pay gap is driven by a lower representation of BAME employees at the most senior levels in GLA. As shown in the Count of Staff table below, there were no BAME staff in pay grades 14 and 15, with concentration in grades 2, 6 and 9 in 2017. The GLA has 0% BME employees in the two uppermost grades. Studies show there are now more BAME workers with degrees in the UK than non-BAME workers. Yet BAME workers are finding it difficult to progress in organisations. The last UK census of 2011 shows that more than 50% of London, Inner London and Outer London are BME. If workforces are to be truly diverse and inclusive, then they must reflect the diversity of the communities they serve. Workers’ organisations such as UNISON enable black workers in the UK to self-organise and campaign together for better employment rights. One starting point to determine organisational diversity is asking employees to identify their ethnic backgrounds. Tracking ethnicity against salaries, pay rises, promotions and training over time can reveal institutional trends and patterns. Studies show black workers are overrepresented at lower job grades, even when they have the skills and qualifications to work at higher levels. Leadership positions in the UK’s largest organisations are still disproportionately white, with only 6% BAME in senior executive roles, even though half of London’s population identifies as BAME. Opportunities to ‘act up’ in more senior roles are often proposed unofficially within personal networks. This means suitably qualified workers aren’t aware of the opportunities nor how to apply. A Manchester tribunal ruled that an employer who promoted an employee without advertising the position, nor giving everyone an equal opportunity to apply, had unlawfully discriminated against a black employee who would have applied for the post if they had known about it. TUC research into training for employees found that white workers are more likely to be offered training than their black colleagues. The effects of missing out on training is cumulative. For instance, those who are passed over for development and promotions at a young age, can experience a pay penalty compared to their equally qualified peers. This penalty will multiply with age. A TUC report also found that for all levels of educational qualifications, BME workers are more likely to be unemployed than white workers even with the same skills and qualifications. They also report a qualification pay gap for young black workers. Studies show black workers with degrees earn a quarter less than white workers with degrees. WERKIN is a tech-enabled mentoring platform, which uses algorithms to match mentors with mentees impartially. The technology can also open up networking opportunities beyond ‘who you know’; and fairly distribute development opportunities by reducing the effects of human bias in such decisions. Although BAME workers now outnumber white workers in London, Inner London and Outer London, ethnicity pay gaps are increasing rather than decreasing in organisations such as GLA. To become truly diverse and inclusive, an organisation’s workforce needs to reflect the diversity of the citizens they serve. This isn’t happening in the UK. The reverse seems more accurate: The more diverse the UK becomes, the more organisations are closing their doors to highly qualified BAME workers. Not only that, once they are employed, the opportunities for BAME workers to progress dwindle as well. If the UK wants to progress and thrive in the global marketplace, they need to open their eyes to the full range of talent available in their community.